Before I get into this post, I wan to make one thing clear: I am a nerd. (Whew. Glad that's out of the way!) Why, you might ask? Well, let me give you an excellent example. I received an email from my cousin some weeks ago saying she was going to The Pioneer Woman book signing. My heart jumped because I had just missed her in L.A. before we moved, and somewhere in my mind I didn't even think to look if her tour was stopping in St. Louis. And she's just as nice and sweet as you'd think she'd be. And I was just as much of a nerd as you'd think I'd be, because I didn't bring a book for her to sign at her book signing. Oh no. I'm one of those freeloaders who just gets her recipes from her website or borrows from a friend who actually owns her cookbook. So when I got up to the table, where her assistant was taking people's books to have them ready for her John Hancock, I sheepishly said, "Um...I don't really have a book for her to sign. I have...a rolling pin." The assistant paused, clearly thrown off her rhythm of hand-book-table, hand-book-table, then smiled and said, "Oh! Well I'm sure she'll sign it." Then, when the rolling pin was passed along to Ree (PW's human name), I burst into a rambling of explanation about why I had a rolling pin and apologizing profusely for not having a book, ending with a sad, "I just wanted to come." She was very gracious, said it was a cute idea, then scribbled her love onto the pin. Then my cousin and I had our picture snapped with her, and I learned a valuable lesson: For the love of all things good and normal and non-nerdy: Don't...chew...gum! awww I missed her here in CA because I was working... but that's so cool you have a rolling pin with her signature. haha. Hysterical! 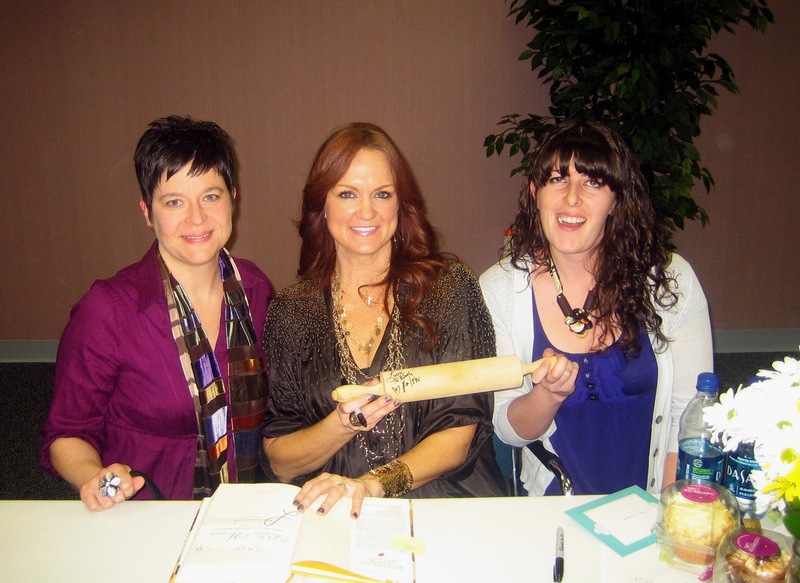 Love that she signed the rolling pin! That is just priceless, really need to frame that one! !